If you observe a feeding fin, blue or humpback whale, you are likely to catch a glimpse of the bristles of baleen that fill its gaping jaws. Baleen is unlike any other feeding structure on the planet. Made of keratin, the same material as hair and finger nails, baleen hangs from the roof of a whale’s mouth and is used to filter small fish and crustaceans from large gulps of water. As water rushes into the mouth of a whale, the small creatures easily pass through the comb-like bristles, but once a whale’s mouth is full of water, it flushes the water back out, trapping the tiny creatures in the wall of baleen to be swallowed whole. Scientists don’t know how or when baleen evolved, but the recent discovery of an ancient whale fossil—roughly 30 to 33 million years old—hidden in the collections of the Smithsonian National Museum of Natural History may hold a critical clue. 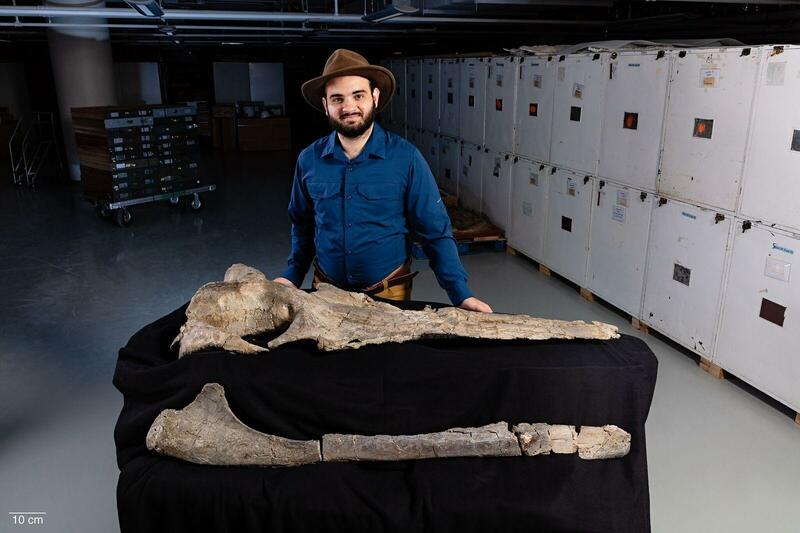 According to a new study published by researchers at the Smithsonian Museum of Natural History, Texas A&M University, the Burke Museum of Natural History and Culture in Seattle, and George Mason University, this ancient whale named Maiabalaena nesbittae fed with neither teeth nor baleen. Today, two lineages of whales exist—those that eat using baleen, and those that eat using teeth and echolocation to track prey. For a long time, paleobiologists have speculated that an ancestor of baleen whales might have both teeth and a primitive form of baleen—what scientists call a transition species. 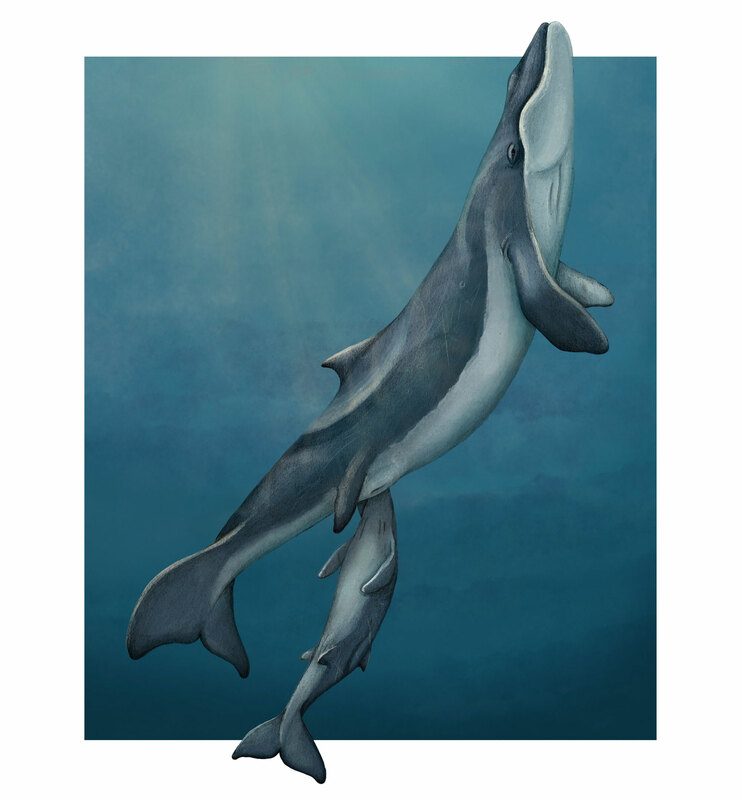 There remains no proof of such a species, but the discovery of Maiabalaena suggests that one ancient species of whale may have needed neither teeth nor baleen to survive. Like most soft tissues, baleen does not fossilize. Finding clues that hint at the existence of baleen in older fossils requires a bit of detective work—simply examining the jaw bones of this fossilized whale with the naked eye was not going to cut it. Instead, scientists turned to the high-resolution powers of a CT scanner to get a close look at the structure of the bone. What they found was unexpected. “It cracked the nut for us in ways we couldn’t have even 5 to 10 years ago. We got an image of what was happening inside the bone and that can tell us whether or not baleen was there,” says Carlos Peredo, lead author of the study and a doctoral candidate at George Mason University. Whales today have elaborate networks of blood vessels in the rooves of their mouths that nourish their baleen or teeth with nutrients. And so, their jaw bones are riddled with microscopic holes. That wasn’t the case for this fossil. Instead, the Maiabalaena skull had indicators of a fleshy gum line, a strong tongue, and muscular cheeks built for vacuuming its meals of squid and fish. With these strong muscles it could shape its mouth to function like a straw—a feat observed in more recent toothed whales like the narwhal and the extinct odobenocetops. The roof of Maiabalaena ’s mouth was slender compared to baleen whales of today, which require broad mouths to anchor their many plates of baleen. It also had relatively long and broad front flippers, an oddity that still stumps scientists. With such a unique method for feeding, it is only logical to ask why this whale would evolve in such a way. What could be the advantage to losing an important feeding tool like teeth? First, teeth are expensive. It takes a lot of energy and resources to build teeth with strong enamel. Slurping food is much more economical when soft food is readily available. Second, this whale lived at a time in Earth’s history when the environment was rapidly changing. As Antarctica broke away from South America at the end of the Eocene, the ocean’s currents were disrupted. Now, with Antarctica alone, a massive current encircles the continent—a change that had massive implications for both atmospheric and ocean temperatures around the globe. While it remains unclear as to how this might specifically have impacted whales, what is clear is that the change in Earth’s climate was a spark that ignited dramatic evolutionary change. “Every time we find a different whale during this time it’s, ‘Oh this is different, this is weird.’ You find two whales right next to each other and they don’t look anything alike,” Peredo says. Whales, usually relatively similar in feeding anatomy, are remarkably different during the Oligocene—the epoch immediately after the Eocene and the change in Earth’s geography. Some of these whales had teeth that looked like the jagged silhouette of a mountain ridge, while others had a simple conical tooth with just one point. There were even whales from the toothed whale lineage that lost their teeth and resorted to suction feeding. This diversity suggests that as the Earth was changing, whales were experimenting with the best feeding strategies, and by the end of the Oligocene they narrowed in on one simple shape that has persisted to this day. As to when baleen emerged? Though it is still unclear, scientists have a guess. The common ancestor of all baleen whales is estimated to have lived 23 to 25 million years ago. It’s likely this undiscovered ancestor emerged during the time of intense change in the Oligocene. It is also during this time that the earliest common ancestor of today’s toothed whales emerged. As our world again enters a new period of rapid climate change, taking the time to look back at how past whales adapted may shed light on how today’s whales will fare. Already there is evidence that whales are changing their migration routes and going after new sources of food . Whales will likely need to evolve more than just their behavior to survive and keep up with the changing world around them.